One Postcard a Day: To Infinity and Beyond! Postcard DE-4980404 from Germany shows a concept art for the Pixar Animation Studios' Toy Story by Nilo Rodis. 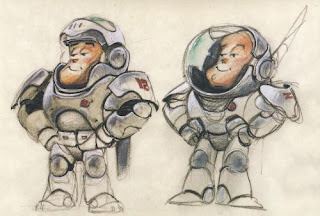 Buzz Lightyear is a fictional character in the Toy Story animation series. He is a toy space ranger hero in the movies and an action figure in the Toy Story franchise.